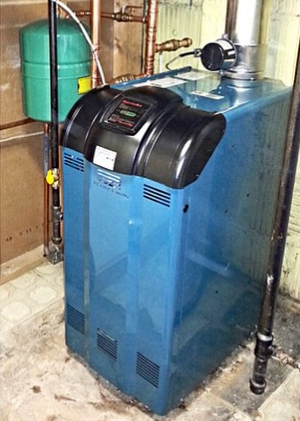 Replacing old boilers in St. Paul saves homeowners money and gives them a piece of mind. Residential boilers are designed to have a life expectancy of 15 to 20 years. Once a boiler has reached this age parts will begin to fail at a frequent rate and the boiler housing itself often begins to rust. If the boiler was not maintained well, it will lose efficiency as it is not be performing at an optimal level costing homeowners even more. This is why it is a good idea to replace the boiler instead of racking up additional costs on repairs and higher energy bills as one of Mill City Heating & Cooling's customers in Saint Paul's Summit Hill Neighborhood did. The customer had recently purchased the home and was frustrated with the number of repairs the boiler required last year. Furthermore, an efficiency test taken from the 17-year-old boiler revealed the boiler was running at 68% efficiency whereas when it was new it would have had an efficiency of 80%. This also indicated that the previous owner was not maintaining the boiler very well plus the new homeowner was losing $12 on each $100 spent on his gas bill due to lack of performance from the boiler. A new 84% efficient Burnham boiler has relieved the stress of having to worry about what part will fail next for the homeowner, plus he received a $100 rebate from Xcel Energy the new higher efficiency boiler.